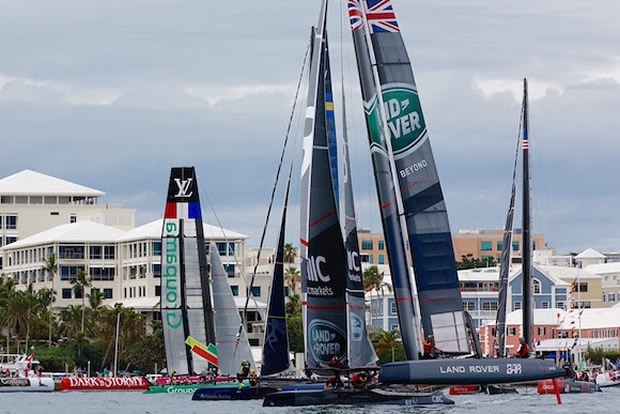 Sunday’s racing in Bermuda will have more points on offer than any other day in the Louis Vuitton America’s Cup World Series to date. After racing was abandoned on Saturday due to extremely light winds, a third race has been added to the schedule on Sunday. All three races will have double-point scoring, meaning up to 60 points are available. Racing is scheduled to start at 14:10 ADT. Weather models show the light conditions of Saturday giving way to 8-12 knots of wind on Sunday, building stronger later in the day. On Saturday, the wind never breached the 6-knot lower limit to allow racing. After racing was abandoned, an exhibition race took place inside the Harbour. The sailors were unanimous in paying tribute to the enthusiasm of the Bermudian crowd and the ability of the course marshals and race management team. Hundreds of boats relocated from the Great Sound race course area to the Harbour in short order, without incident, allowing for an exhibition race. Land Rover BAR Tactician, Giles Scott said: "Today was disappointing, there's no way to dodge that fact; we wanted to race, the crowds wanted to see us race, but the weather just didn't cooperate. The best thing we can say about today is that because we didn't sail they will change the schedule and we will now have the chance to do three races, rather than two tomorrow. That's good news, the forecast looks good and it's still all on." Wing Trimmer, Paul Campbell-James added: "The fact that the racing didn't happen today makes Super Sunday all the more important, now there are three double points races tomorrow and only 7 points between the top three teams. So tomorrow will be the single most important day of racing in the whole season so far. There's a great forecast, the team feels good and we're excited for it. Bermuda is always awesome, it was great to see the crowd at the opening ceremony, and we're looking forward to some more 'home team' support tomorrow!"